These recently arrived in Australia (I am actually impressed with how quickly they arrived!!) and I decided to pick one up! 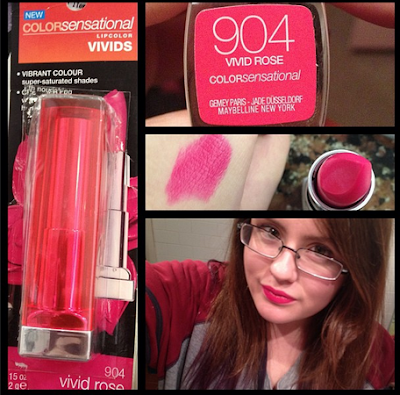 The lipstick I picked up was in the shade Vivid Rose which I am quite in love with. It is a vibrant pink (as you'd imagine from a lipstick line titled 'vivids') and despite my extensive lipstick collection I am pleased to say I have nothing like it! The colour is pretty long lasting and stays vibrant for 3-4 hours (I reapply by habit so it's hard to be exact). I bought this from Woolworths for $16.95 which is the standard price for all Maybelline ColorSensational lipsticks in Australia. Now THAT is a pink. Beautiful shade! These came quite quickly to Aus which I am happy about, now for the color whispers! I'm really interested in picking up Shocking Coral. All content written by Krystal Cameron. Ethereal theme. Theme images by Ollustrator. Powered by Blogger.